Elegant Countertop Stainless Steel Tabletop Wine Glass Drying Rack Stand. Enjoy the elegant life.MATERIAL: Iron, Color: Bronze.Hold 8 Wine Glass and 4 Bottles of Wine.QUALITY MADE: Soft and shiny, show clear lines and delicate in texture, Shiny outside highlights the texture of luxury.SIMPLE SHAPE: Grape piece,simple but classic feel.SAFETY BASE: Onice base,more care about your wine. Made of top quality metal, features durable metal construction and 4 sturdy feet. Approximate Size: 16.1" L X 5.9" W X 15.9" H.Does not include bottles of wine or wine glasses. Holds up to 4 wine bottles and 8 glasses.Great for displaying and serving a few bottles and glasses for visitors & guests. 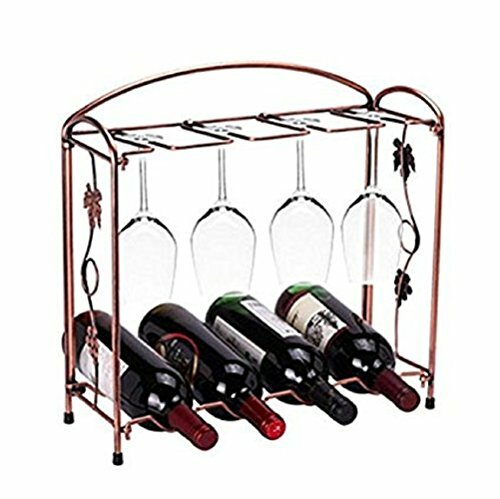 Elegant leaf accents, circular design and old time bronze color features a sophisticated wine bottle organizer. Holds up to 4 wine bottles and keeps them horizontal to keep the cork wet and prevent flavor-killing oxidation from destroying your wine. If you have any questions about this product by Miniway, contact us by completing and submitting the form below. If you are looking for a specif part number, please include it with your message.